Commercial Viability or Death by Greed? 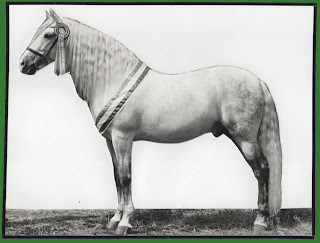 At the start of writing about the plight of the Hispano-Arabe and the steps being taken with the breeding expansion plan, I talked about the need for the breed to be bred and produced for the appropriate commercial market according to its functional use as a horse in modern times. 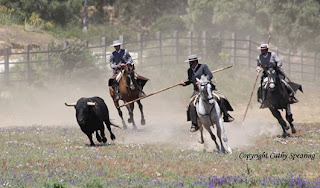 In Spain there has never been any doubt about the abilites of the Hispano-Arabe and the role it has in the agricultural market as a versatile working stock horse. In the same way that equine breed regeneration programmes here in the UK have looked at the modern commercial viability of endangered native equines and targeted their modern market to help perpetuate demand and thus support the survival of the breed, so the Spanish have looked at the adaptability of the Hispano-Arabe to other roles outside of ranching. Here in the UK unlike the USA and Australia we do not have an agricultural use for the Hispano-Arabe stock herding cattle over vast countryside. Our interest in the Hispano-Arabe is for the versatility of the breed as an all around sports horse in the leisure riding industry. It is from this area of non-professional horse riding that nearly all our successful professional competition riders started out, learning and developing their skills with the assortment of Native breeds and partbreds capable of multi-sport diversity. Despite the UK having the highest number of horses than any one European country, it lags far behind these countries in the development of the sports horse, which is the role for which the Hispano-Arabe is well suited. Our horse industry is strangling itself by funnelling all its effort into breeding for the tiny minority of competition riders wanting expensive, big, powerful horses designed with high level capability in one specialist area of performance! There are excellent horses being bred and produced for the specialist competition market, and the stud fees and youngstock selling costs reflect the high performance achievements of the stallions used and the potential or expected career attainment level of the progeny. The insanity that holds back the development and growth of the non-horse-racing industry is the belief by some stallion owners that all stallions regardless of breed or ability should command the same phenomenal fees as successful proven performance horses. The Hispano-Arabe is not a high performance 'mono-sport' horse; it is an extremely versatile, intelligent all round riding horse. Outside of horse racing the UK horse industry ranges from professional through to leisure with many semi-professional riders in between. Of the 2.5 million plus horse owners, nearly 80% of these participate as owners and riders interested in the leisure industry side of horse owning; ie they enjoy simply riding, hacking out and attending shows at the non-professional level of competition. 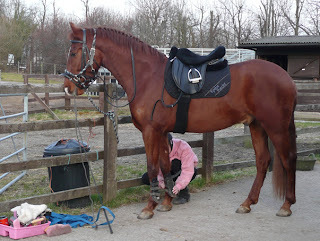 Research a few years ago also showed that a quarter of these horse owners annual household income was under £10,000. 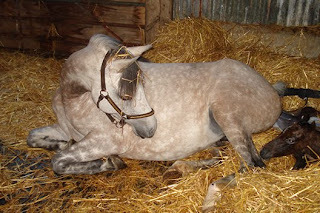 While not discounting the fact that it is not cheap to breed and rear horses and the old adage is that it costs the same to breed a good horse as a bad one, breeders and owners do have a responsibility to be realistic about the costs they are expecting when taking into account the capability of their horses and the market into which their horse belongs. In the case of the Hispano-Arabe, fortunately, there are sensible owners of both Arabian and PRE horses that understand the need for co-operation to negotiate sensible stud fees (taking account of both the type of market these horses are to be produced for and the necessity for expansion of the breed) to aid in the regeneration of the breed through the first generation out-crossing programme. In this country we have seen just about every one of our own Native horse breeds at some point teeter on the edge of extinction and in every case the owners and breeders have pulled together constructively to save their horses from extinction. They have not been confronted by the vulture mentality of owners delighting in claiming 'rarity' as a justification to bump production costs up and drive the knife of extinction further into the heart of the breed! Before a foal is even born the mare owner has to invest in veterinary fees to swab and clear the mare fit for breeding, this can be in the region of £200. There is then the stud fee to the stallion owner, if AI is involved the mare owner is looking at another £200 in insemination and veterinary costs. It is easy to see to see that before a live foal is even produced a mare owner if having to pay out extortionate stud fees is looking at nearly £1,000 outlay. This has still not taken account of any transportation or keep fee costs for the mare. If you then factor in the cost of maintaining the mare till foaling, any veterinary fees that may arise if there are foaling problems and routine vaccinations for foals. Then there is breed registration with DNA typing, micro-chipping and passports; all of which can add to another £400. It is easy to see how production costs in the breeding industry can mount up, but while certain expenses can not be avoided, the extortionate rates of stud owners for non performance untested stallions can be avoided when breeding for the leisure market. If the stallion owner takes time to think constructively about the horse industry, they will see that the high money spending market is very limited, so while they may get a few mare owners able to lay out high stud fees for riding horses, the bigger market in the long run is the 80% leisure industry. Without breeders being sensible young riders..
can never hope to afford good horses to learn and train on. Or are we in an age where only the elite wealthy may own horses? The stallion owner has to have the common sense to assess the quality of the mares being sent to stud no matter what level the stud fee is. The decision to turn down unsuitable mares and be selective is far more likely when the stud fee is not prohibitive and the market bigger. Mare owners having the funds to pay high stud fees has no correlation to the quality of their mare, the market is full of horses boasting outstanding paternal pedigrees but the resultant stock exhibiting nothing of that stallion in conformation or abilities! The intention that we strive for, is the expansion and production of good quality Hispano-Arabe riding horses for the leisure industry; and perhaps one day its influence being seen in the development of the UK sports horse. We are not interested in the production of horses no one can afford to buy and whose production is for the novelty 'rarity' value. Officers from DEFRA's equine identification and zootechnique dept have been working with me to facilitate our application for a recognised independent Hispano-Arabe Breed Association. Previously it had not been bought to their attention that the breed was on the critical endangered list needing special protection. Their experience in this area of supporting the setting up of breed studbooks has in the past dealt with native equine breeds and not a foreign breed daughter stud book. In the normal EEC regulations there is a requirement for the stud book to be set up with an advised minimum of 50 mares and 17 stallions. In Spain at the start of their recovery programme they were struggling to meet normal requirements...but that is the nature of the definition 'critical to point of extinction'! DEFRA recognises that there is a precedent for modification of the regulations in these circumstances, taking account that if correctly managed here in the past 30 years there would by now have been more than adequate breeding numbers of Hispano-Arabe horses. The case is further supported by the breed regeneration plan incorporating the outbreeding to use the two parent bloodlines. Therefore, allowing time to establish relations with Spain for inclusion in the parent stud book, source and assimilate experience in management of Equine Breed associations, and for our UK Hispano-Arabe owners and future interested parties to work together in formulating their future breeding strategies and exactly what direction we want to take our own breed organisation in, DEFRA have advised that they are working towards full independent registration for 2011. In the last few years the Spanish Department for the Environment, and Rural and Marine Affairs have been actively high profiling the importance of the Hispano-Arabe horse in their own country, particularly as the regeneration programme that has been under the control of the Cria Caballar has reached a point where evaluation indicates they have established a sound successful method of breed preservation. As the system applied has proved viable the Hispano-Arabe Stud Book has been passed to the control of Union Espanola de Ganaderos de Caballos de Raza Hispanoiarabe (UEGHa'). This is the association of cattle ranchers for whom this breed of horse is an integral part of their industry and history. The functionality and development of the breed into the unique horse that it is, is very much intertwined with the working lives of these cattlemen and their need for the breed to continue in that relationship is the strongest natural selection criteria that will ensure the fixing and pre-potence of the Hispano-Arabe as a breed. The Spanish government has been very helpful in dealing with my request for assistance in re-establishing our contact with the parent stud book for recognition of our status as the official UK daughter stud book. To that end the Director of UEGHa' Senior D. Javier Fernandez Alvares has confirmed his delight and willingness to continue inclusion of our horses and resume registration and grading of Uk Hispano-Arabe horses. He is prepared to visit the UK to discuss matters as soon as we wish. With the two govt bodies now in full support of sustaining our Hispano-Arabe horses it is up to you to start actively voicing what you would like to see happen for the future viable sustainability of these horses here in the UK. I'm only too well aware of the past in-house personal issues that have fragmented the breed, but it is the hard logistical matters that I need feedback from you about; in order to go the negotiating table at the outset and eliminate the problems before we start. As a small organisation there are clearly issues about financial sustainability of the breed from the point of documentation costs. In this I'm looking at comparable organisations in order to at the outset negotiate with Spain viable pricing structures as well as looking at sensible fast procedures to process documentation. There are also matters regarding costs and logistics for organisation of grading of our horses that need to be considered. I'm liaising with several other official organisations to investigate what grants may be available to assist with the financial burden necessitated by the unique conditions of dealing with an endangered breed that requires greater involvement by its parent stud book. The Hispano-Arabe horse is an indigenous Spanish breed that had been “breeding true”for hundreds of years with consistent, replicable and predictable characteristics even when occasional outcrossing occurred to improve the breed. The regeneration plan that Spain instigated when the Hispano-Arabe was on the critical point of extinction due to its low numbers of breeding horses, required special allowance of “outside” blood to improve the overall health and vigour of the breed. Historically the Hispano-Arabe has its foundation in two purebred breeds; the Arabian and the Pure Spanish Horse of Andalusia. The regeneration plan for the Hispano-Arabe involves “re-infusing” the breed with new bloodlines from the parent purebreeds. In a normal breed improvement plan the simple breeding of existing Hispano-Arabe horses with the permitted Arab or Pure Spanish horses would be the system operated. However the Hispano-Arabe breeding stock numbers were so critically low that a more radical recovery programme had to be implemented. A responsible crossbreeding process to produce hybrid F1 and F2 Arabian x Pure Spanish horses was agreed upon with the intention that over time these “new” Hispano-Arabe stocks would be bred with each other and with the original Hispano-Arabe bloodlines. In order not to dilute the influence of the parent bloodlines of these horses a percentage blood ratio of Arabian:Spanish was agreed upon which permitted a minimum of 25% Arab blood and maximum of 75% Arab blood. As a further evaluation strategy all existing original Hispano-Arabe breeding stocks regardless of actual Arabian blood content were graded for entry to a Foundation Stud Book and rated as being a baseline 50% Arab. For owners breeding first (F1) and second (F2) generation “new” Hispano-Arabe horses by the permitted crossbreeding programme the production of Hispano-Arabe appears to be a very simple endeavour. However as some early owners discovered when the grading stage was involved, their horses failed to meet the standard for approval in the breeding register. To produce a Hispano-Arabe it is not a simple matter of taking “any” Arabian and breeding it to “any” Pure Spanish horse. Both of these pure breeds within their own acceptable breed standard have a range of phenotype profiles. In the UK we have a far greater diversity of Arabian horses than Spain has had in her history of the breeding of the Hispano-Arabe. The Pure Spanish horse in its recent history has also been selected to diversify into a heavyweight and a lightweight phenotype. For our UK breeding programme to increase our production of viable Hispano-Arabe young stock that will pass grading we have to be selective in using the heavier profile Pure Spanish horses and Arabians of Spanish, Polish, Russian and old Crabbett type. The evaluation criteria that Spain has been fine tuning over the last 30 years takes into account a reasonable range of profile diversity with in the new breeding programmes but is ultimately travelling towards a more fixed breed type. Here in the UK I have the only foundation Hispano-Arabe bloodlines and eventually the progeny descending from Piyayo will be bred across and infused into the new Hispano-Arabe stock just as foundation lines in Spain are being used to fix the breed there. The arbitrary classification of the original foundation horses as 50% Arab carries with it a loaded dice concept to the breeding programme with respect to the effect or influence these horses will have upon the Hispano-Arabe stock of true quantifiable Arab ratio. For example Piyayo on paper is listed in the closed Foundation Stud Book as 50% Arab. In reality when the Arab Horse Society was interested in registering him with them for his sports capability they could not trace even the required proven 7% Arab they needed to validate him. The predictable stamp that he passes down on the outbreeding programme I have had to operate is the original Hispano-Arabe influence. Thus, his two daughters; one out of a Polish Arabian mare and one out of a PRE mare while registered as respectively 75% and 25% Arab are in phenotype nearer to 50% and 1% Arab. The original Hispano-Arabe fixed geneotype from Piyayo gives all his line a distinctly different profile to other Hispano-Arabe horses of the same documented percentages. This difference is occurring in Spain even more so given that they have more foundation bloodlines. However the influence of these horses in Spain has already started to be diversified by the foundation bloodlines at various points being breed with the new Hispano-Arabe stock thus steadily producing a leveling off; and as intended fixing of a breed standard. Failure of this country to expand the breed here and to make full use of the only foundation horse available (Piyayo produced three Hispano-Arabe colts/potential stallions from unrelated Arabian mares; none of them were inscribed onto the Hispano-Arabe stud books due to deliberate actions by the appointed registrar of the time) and to expand its F1 breeding programme, means that we are dealing with breeding programme that will be dominated by outcross bloodlines and take far longer to fix the breed standard. In Spain the Hispano-Arabe breed is still on the critical register for survival so it is highly unlikely that quality breeding horses will find their way here to help improve our genetic pool. Although with Calificardo grading now opening the door to AI this new avenue of breed improvement is something I'm negotiating with Spain. In the meantime without implementing a draconian breeding programme I hope that anyone considering breeding Hispano-Arabe horses will make use of our help and advice in order to ensure the production of viable Hispano-Arabe horses. Of course apart from breeding for percentage ratio and phenotype there also has to be consideration about function, the inheritable multi sports ability of the breed. When naturally breeding from a small gene pool even with the allowed “outside” blood there will be by necessity to fix the breed, a requirement to linebreed or inbreed to prevent dilution while still seeking a balance of breed diversity. To provide advice in this area I have requested the assistance of The Animal Health Trust geneticists who specialise with other rare equine breeds such as the Shire Horse that face the same problem of balancing their breed strategy. When required Fred Barrelet of Beaufort Cottages has also kindly confirmed his interest in providing assistance on veterinary protocol in dealing with our rare breed future strategies.